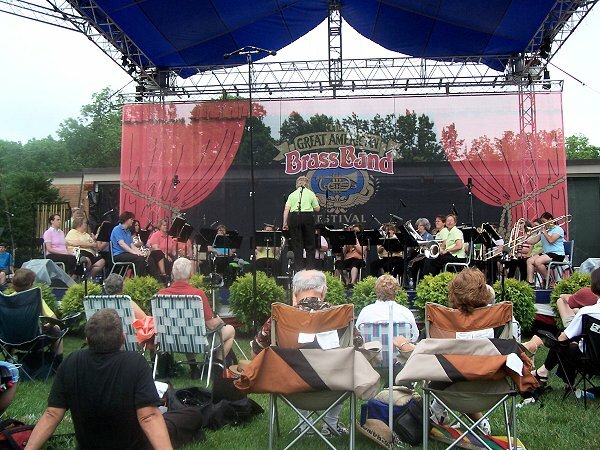 The 17th annual Great American Brass Band Festival was held in Danville, Kentucky 10–12 June 2005. The festival, held primarily on the campus of Centre College, is hosted by the Advocate Brass Band, based in Danville. 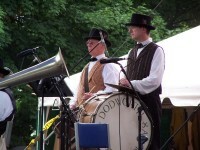 Participating groups in the 2005 festival included historic re-enactment bands, such as Saxton’s Cornet Band and Dodworth Saxhorn Band, playing mid-19th century instruments. 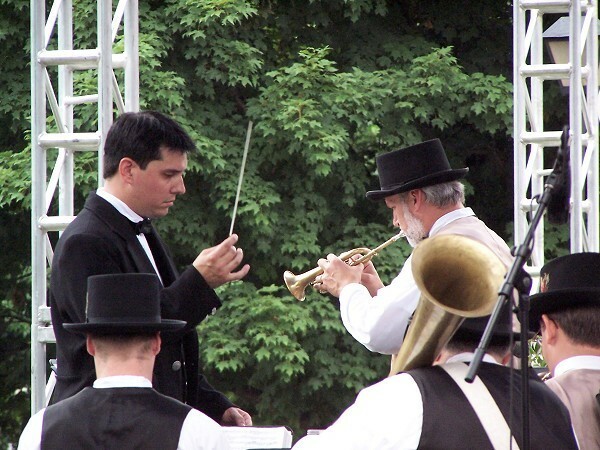 The jazz brass tradition was represented by groups such as the Great Olympia Traditional Jazz Band, the DiMartino/Osland Jazz Orchestra, and Rhythm & Brass. 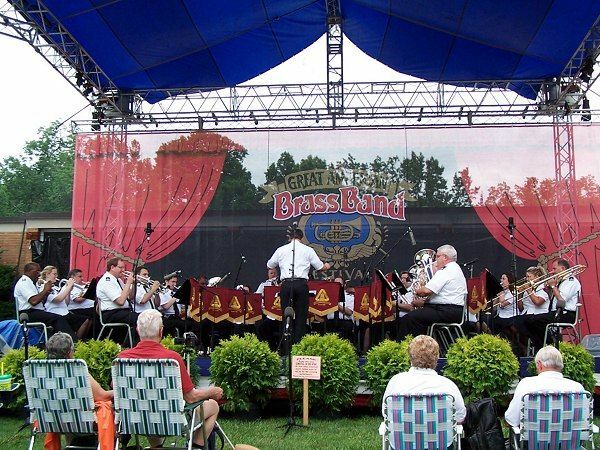 The British brass band style was represented by the Chicago Brass Band (current North American Brass Band Association champions), the Athena Brass Band (an all-star, all-women group), and the National Capital Band of the Salvation Army. 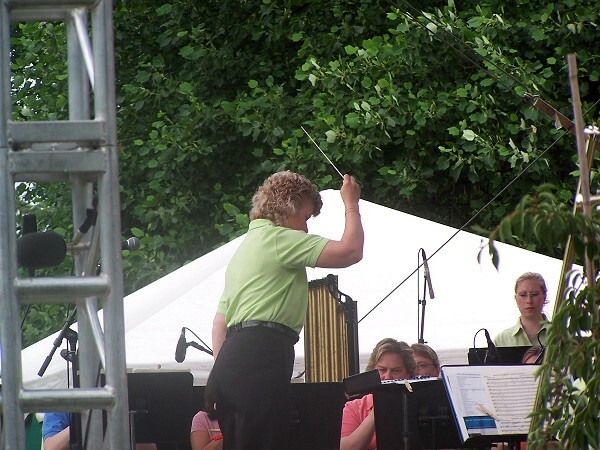 Featured soloists included Dr. Patricia Backhaus, trumpeter Allen Vizzutti, and euphonium virtuoso Steven Mead. 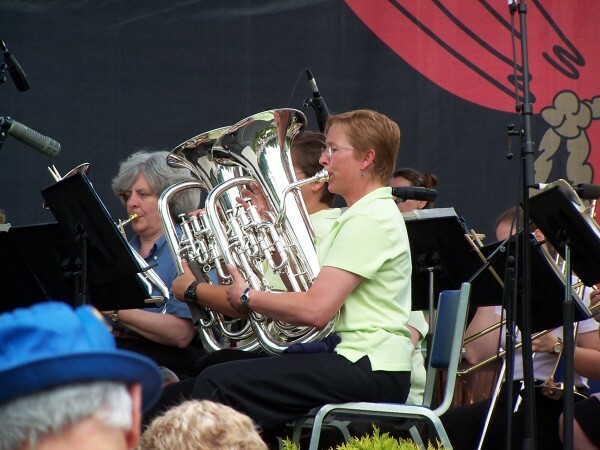 The festival weekend was preceded on Friday, 10 June with a conference on the History of Brass, including presentations by, among others, Steven Mead and Douglas Yeo, an outdoor concert by the Athena Brass Band, and a contribution from Rhythm & Brass. 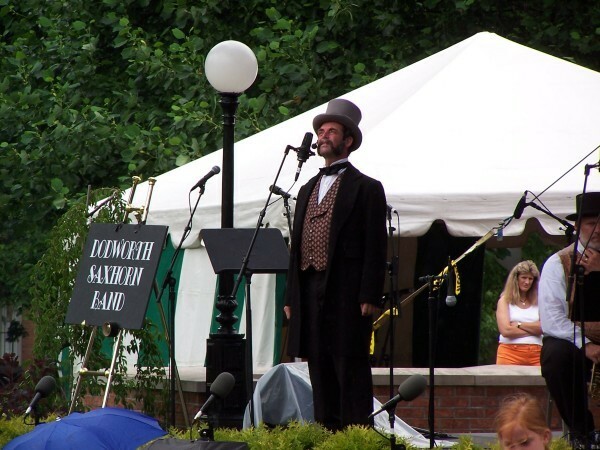 On Saturday, there was music throughout the town, with bands at Constitution Square and outside the local courthouse as well as on the Main Stage at Centre College. At 11:00 am, most of the participating groups, along with other local units, marched in a short parade from Constitution Square to the Main Stage. Concerts continued, changing groups every hour, until nearly midnight. More music was presented on Sunday, beginning with an ecumenical Community Worship Service (held in the Norton Center for the Arts on the Centre College campus because of inclement weather) and more concerts into the afternoon. Audiences at the Main Stage venue, which was in the central quad of the campus, were estimated at more than 10,000 people, despite humid and rainy weather all day on Saturday. 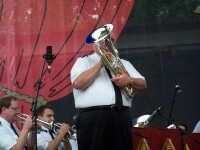 One of the features of the Great American Brass Band Festival since the earliest events has been the inclusion of a representative Salvation Army Band. 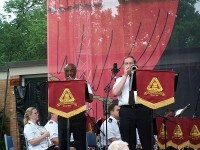 This year, the band invited was the National Capital Band (Bandmaster James Anderson) based in Washington, DC. 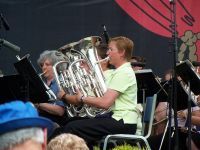 The rest of this report follows the experience of the National Capital Band in its third visit to the GABBF (previous trips to the festival were in 1992 and 1997). The NCB flew to Kentucky from various airports in Virginia and Maryland on Friday, 10 June 2005. Unfortunately, some of the flights were delayed because of poor weather conditions, and the group did not arrive at the Centre College campus until near midnight. On Saturday morning, the band’s first scheduled performance was to march in the Festival parade at 11:00 am. Several members got up early and walked a few blocks to a local church that was hosting the “Great American Pancake Breakfast”. 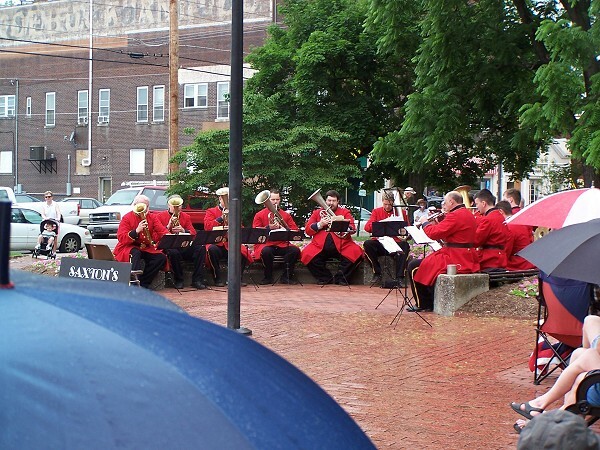 Along the way, they passed the Weisiger Park, the courthouse concert venue, where Saxton’s Cornet Band was performing. The band gathered in the instrument storage area behind the main stage at 10:15 am and walked up to Constitution Square, about six blocks away, the staging area for the parade. There was also a concert venue at Constitution Square, and as the NCB waited for the beginning of the march they were treated to some items from the Chicago Brass Band. The Chicago band was in fine form, despite having to play under a tent because of the slightly inclement weather. After finishing the parade, during which the band played the marches To Regions Fair (Norman Bearcroft) and The Pioneers (James Anderson), members of the NCB settled down to listen to some of the groups on the main stage, as the NCB’s next performance time was at 3:00 pm. The first group up was the Athena Brass Band, under the direction of Anita Cocker-Hunt. 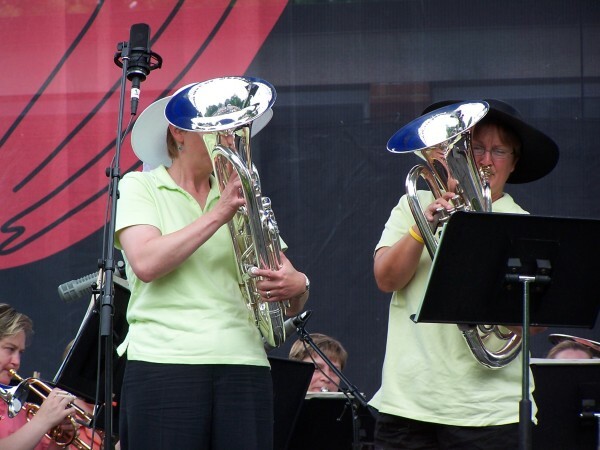 The idea of Laura Lineberger, a euphonium player and librarian with the US Army Band, this traditional British-style brass band consists entirely of women players gathered from other brass bands, military bands and orchestras throughout the US. Highlights of their Saturday concert on the main stage included a virtuoso soprano cornet solo, an exciting rendition of Peter Graham’s Gaelforce, and a version of the classic cornet solo The Debutante arranged as a euphonium duet by the band’s second euphonium Gail Robertson and performed by Robertson and Lineberger. The next group was the Dodworth Saxhorn Band (Musical Director Damon Talley). This group plays antique instruments dating mostly from the time of the US Civil War. Wearing period costume, they presented a historical program, featuring American patriotic readings such as the Gettysburg Address with music of the same time. One highlight of the presentation was their principal soprano saxhorn player, Paul Roache, who played the third movement of the Hummel trumpet concerto. The next group was a US Army unit band, the 202nd US Army Band. 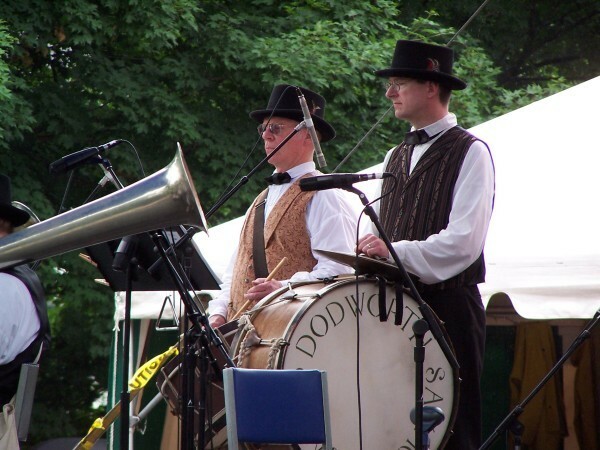 Although this group is not strictly a brass band, it is a direct descendant of the early US Army bands, which often used an all-brass instrumentation similar to the Dodworth Saxhorn Band. 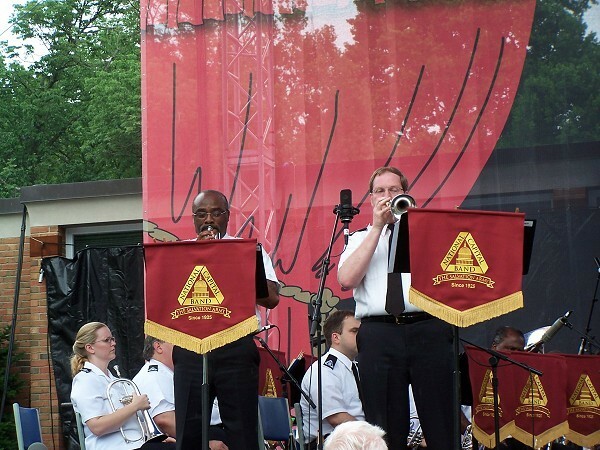 The National Capital Band of the Salvation Army, under the direction of Bandmaster James B. Anderson, was the representative Salvation Army band at this year’s festival. 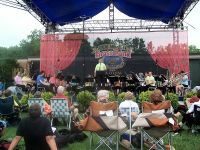 The band followed the 202nd US Army Band on the Main Stage on Saturday afternoon. The band opened its one-hour concert with a classic march, Minneapolis IV (Emil Soderstrom), followed by Leonard Ballantine’s swing arrangement Since Jesus, featuring a lovely trombone solo rendition of “Amazing Grace” played by principal trombone Stephen Bulla. 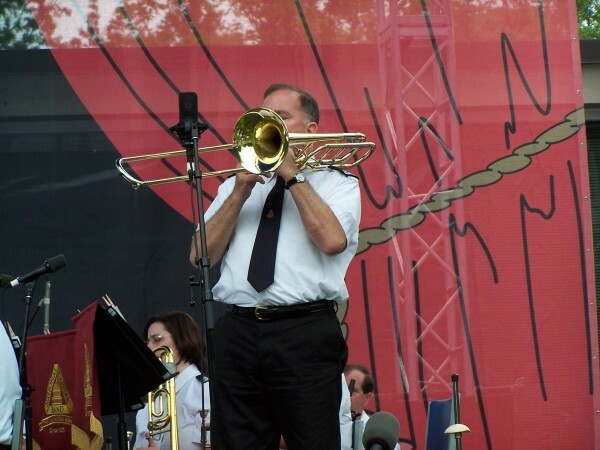 Principal euphonium, Major Tony Barrington, presented the old variations solo Ransomed (George Marshall). The band them played the country-flavored Bringing in the Sheaves, followed by an American classic melody, Someone to Watch Over Me (George Gershwin, arr. William Broughton), played as a cornet solo by principal cornet Ian Anderson. Anderson was then joined by soprano cornet Noel Morris for a rendition of Peter Graham’s cornet duet Quicksilver. The “big item” for the concert was James Curnow’s A Psalm of Praise and the performance concluded with another classic march, The Red Shield (Henry Goffin). 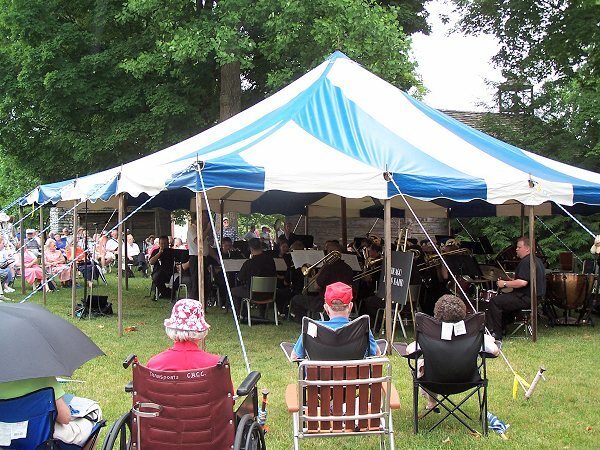 Following the National Capital Band’s performance, picnic tables were set up in front of the main stage, for the “Great American Picnic”, a traditional part of the festivities. 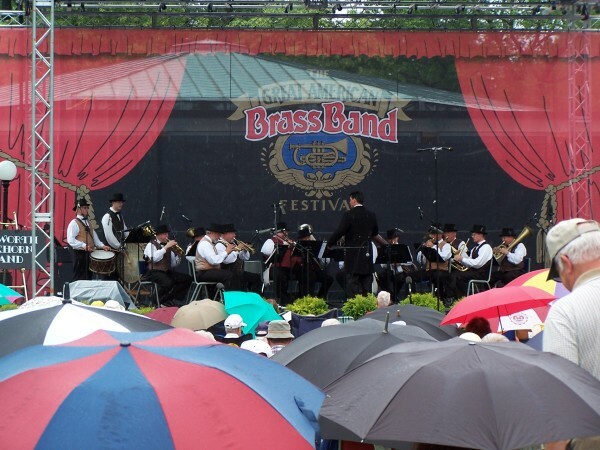 Performances on the main stage continued with a “clown band”, the Circle City Sidewalk Stompers; ragtime pianist Scott Kirby; cornet virtuoso Allen Vizzutti with the Advocate Brass Band; and a Canadian ensemble, Brassroots, led by Bram Gregson. 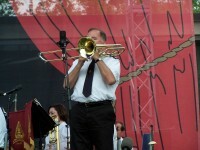 The “major” concert of the evening was at 8:00 pm, with the Chicago Brass Band and special guest soloist Steven Mead. It was remarkable that the large crowd remained steadfastly in place throughout the day, despite humid and rainy weather. Mead was in fine form, playing several solos of various genres, including the lyrical item The Lark in the Clear Air and the technical showpiece Brillante. The band was up to the task of accompanying such a powerful player, and also presented several items on their own, showing the form that won the Championship section of the North American Brass Band Association contest this past March. Following this performance, music continued into the night, with Rhythm & Brass and the Great Olympian Traditional Jazz Band, accompanied by fireworks at around 10:20 pm. On Sunday, six local Danville churches join together for a Community Worship Service, which is a part of the Festival. Usually held at the Main Stage, this year’s service had to be moved into the nearby Norton Center for the Arts because of heavy rains early in the morning. The National Capital Band and the Great Olympian Traditional Jazz Band provided music for the service, along with a Community Choir. Immediately following the service, the National Capital Band returned to the Main Stage (where it was now bright and sunny) for another one-hour concert. 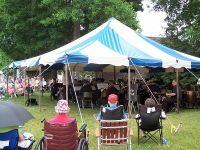 This concert was similar to the Saturday afternoon performance, with the substitution of Andrew Mackereth’s Keep Me Praising for Since Jesus and the addition of Bandmaster Anderson’s simple arrangement of Jesus Loves Me. 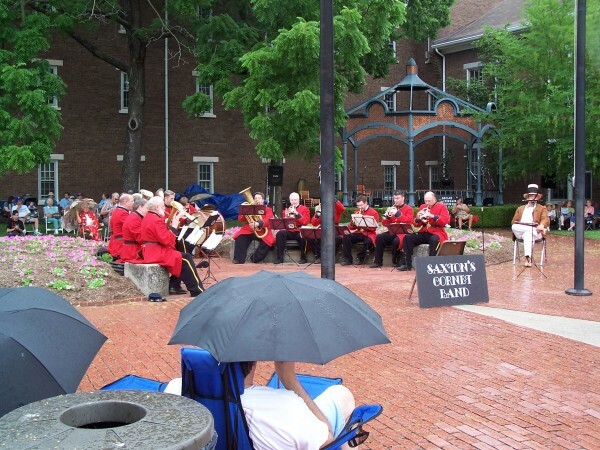 Following the Sunday concert at the Main Stage, the National Capital Band made the short trip to The Salvation Army’s Danville Center for Worship and Service for lunch. 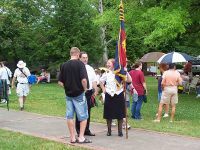 The commanding officers at Danville, Captains Zachary and Shelley Bell, are both former members of the National Capital Band and Timbrels. During the luncheon, Band Chaplain Joe DeMato made a special presentation. Traditionally, the NCB has an end-of-year dinner, and one of the highlights of the dinner is the passing on of “Bob’s Big Note”, an award begun by former Band Secretary Bob Goodier. The award is given to a member of the band who has worked diligently throughout the season, and is awarded by the previous year’s recipient. Joe, who received the Note at last year’s dinner, passed the note on to principal baritone Robert Schramm. 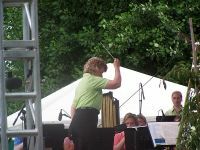 This article was posted in News and tagged Allen Vizzutti, Anita Cocker-Hunt, Athena Brass Band, award, Bob Goodier, Bob's Big Note, Centre College, Chicago Brass Band, Christina Anderson, Damon Talley, Danville, Dodworth Saxhorn Band, Douglas Yeo, euphonium, Gail Robertson, Great American Brass Band Festival, Ian Anderson, James Anderson, Jo DeMato, Kentucky, Laura Lineberger, National Capital Band, Noel Morris, Patricia Backhaus, Paul Roache, Robert D. Schramm, Saxton's Cornet Band, Shelley Bell, Stephen Bulla, Steven Mead, Tony Barrington, trumpet, Zachary Bell on 20 June 2005 .